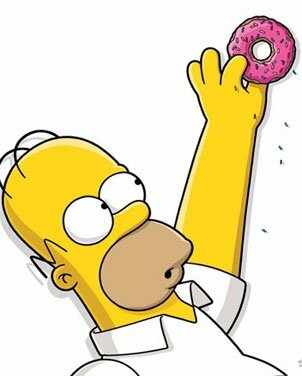 ← Should I Spend Donuts on the Burns Chalk Outline? Make Burns Invest in the School- 3hrs. 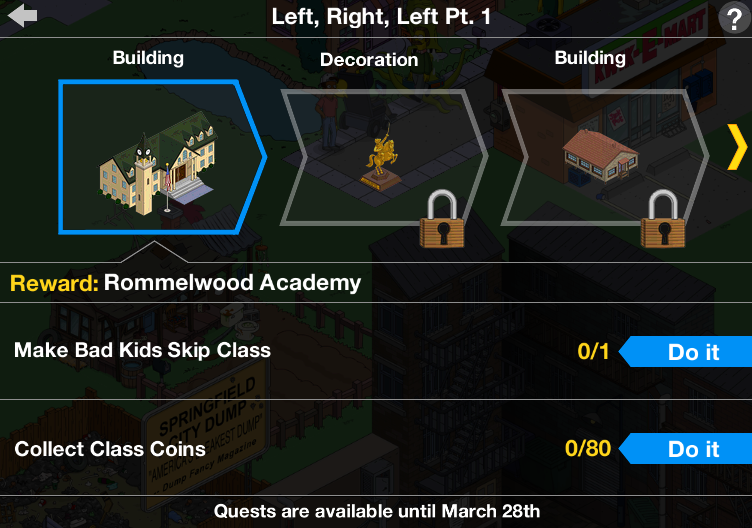 Once you’ve completed that task you’ll automatically be awarded the Facade for the elementary school…. You won’t have an option to store it, this one is just a facade (skin for a building) for your Elementary School. So your Elementary School will automatically become the Crypto-farm. And that’s really it my friends. No conform-o-meter impact, no earning potentional. Nothing. 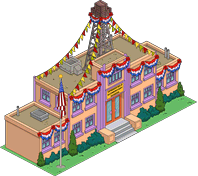 Just a new look for Springfield Elementary. 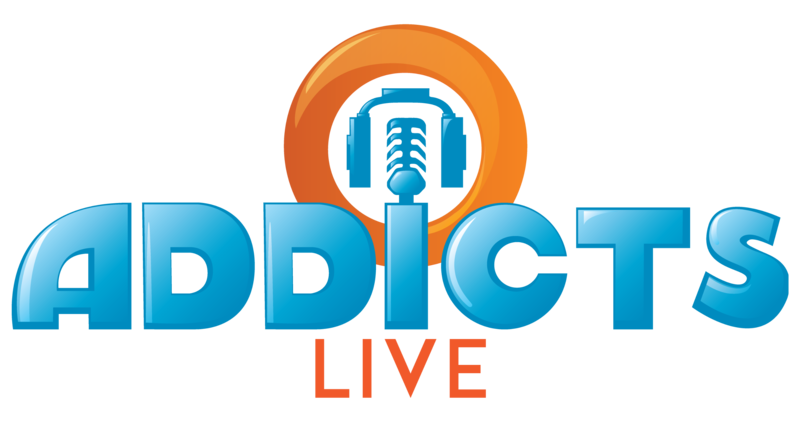 Collect it and move on…. And that completes the details of the first Who Shot Mr. Burns? (Part Three) prize! 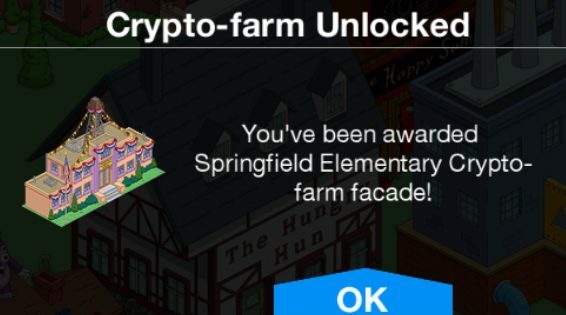 What are your thoughts on the Springfield Elementary Crypto-Farm? 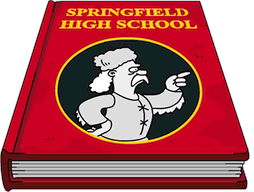 Will you be using it in your Springfield or going back to Springfield Elementary? Sound off in the comments below, you know we love hearing from you! 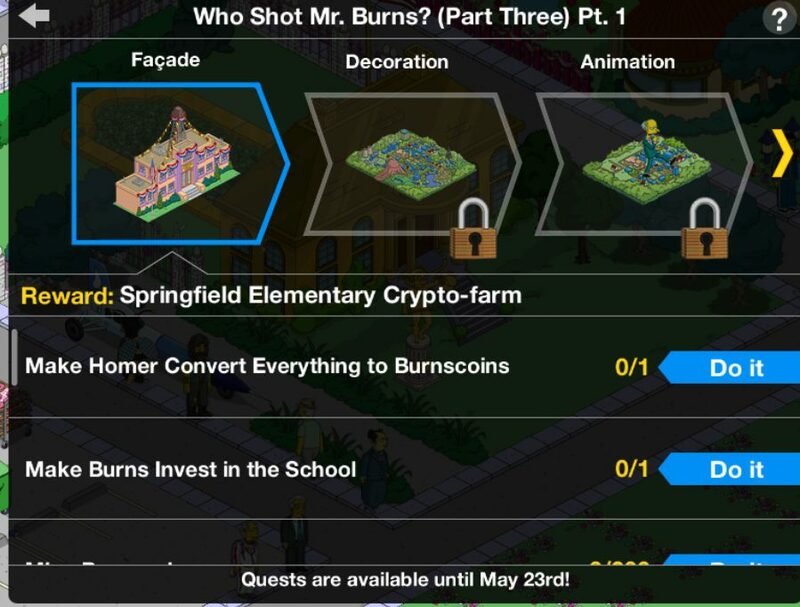 This entry was posted in Tips and Tricks, Updates, Who Shot Mr. Burns 2018 and tagged how do i get the ribbons on my Springfield Elementary, Tapped Out Mini Event, Tapped Out Tips and Tricks, The Simpsons Tapped Out, TSTO Addicts, TSTO Tips and Tricks, What does Springfield Elementary Crypto-farm do?, who shot mr burns mini event, Who shot Mr Burns questline. Bookmark the permalink. My school started earning cash. Did the facade start doing this or is it just a change to the school from the update? It does it without the facade. I think it was part of the update. Have to say that wasn’t very exciting. Oh well, it’s over. What’s next? Problems logging in? Anyone? Anyone? Bueller? Not logging in, but constantly getting kicked out. I just look at it as time to take a break. I’ve been very fortunate that the glitch never hit me (knock on wood), & I feel bad for everyone it did, so I can’t really complain. Had to try several times yesterday, but then everything was fine. Error message said something about not being able to process the login at the moment. Seems it might be iPhone. I’ve been able to get in on my kindle. iPhone still won’t let me log in. When did the school start earning money? When you earn the facade!! I was a victim of the last event’s “Glitch”. So far so good – everything seems to work. When the last event went away, so did all my problems. Happy. Glad I didn’t run away, this has been a fun little event. Just wish my glitch was gone. I keep crossing my fingers with each update it goes away. I miss my railyard and REALLY miss the left corner Character finder.